The National Register eligible Bethlehem Steel Administration building in Lackawanna, NY has been under direct threat of demolition since May 2012. Over the course of the summer there were numerous attempts made to broker a deal with the building's owner, however, those efforts ended unsuccessfully. The City of Lackawanna stayed its course and continued to argue for the building's demolition. In late January, crews from Zoladz Construction began demolition, starting with the chemistry lab located in the back of the building. Since then, the area's preservation groups remained silent as if the building's fate had been sealed. Preservation Buffalo Niagara issued a statement shortly after demolition began last month. "It didn't have to end this way," according to PBN's Executive Director Tom Yots. As the demolition began, a small group of activists which included Meagan Baco, Lesley Horowitz, Dana Saylor and myself focused on the next steps in saving this historically significant industrial icon. Our research uncovered a previously withheld structural engineering report conducted last August by Klepper Hahn & Hyatt. This report was obtained through a Freedom of Information Act request and confirmed what we'd already suspected through our own photographic documentation: that the building is structurally sound. The KHH report's findings directly contradict Lackawanna Code Enforcement Officer Steven Bremer's own observations and conclusions about the building's condition. Within hours of reading the KHH report our group reviewed the case with attorney Richard Berger who advised us that there were grounds for a lawsuit. We proceeded to contact two additional attorneys Michael Raleigh and Paul Fusco-Gessick who were also brought in to work on the case. On Thursday, February 7th we held a press conference announcing our findings and our readiness to file the lawsuit against the building's owner. 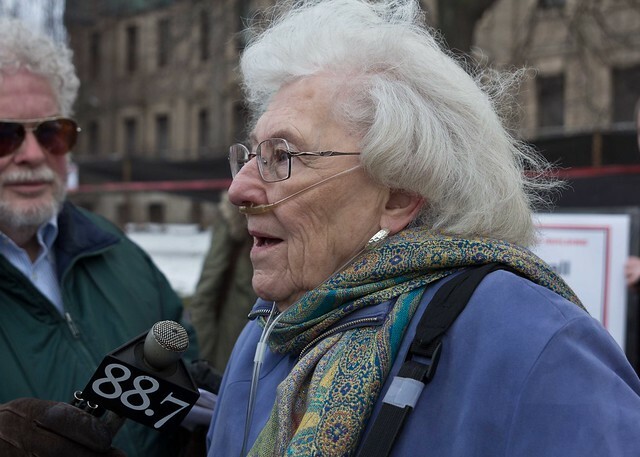 Below Lackawanna resident Romaine Lillis speaks at Thursday's press conference announcing the lawsuit. On Friday, February 8th a lawsuit was filed in Lackawanna City Court by attorney Richard Berger. The plaintiff is the Lackawanna Industrial Heritage Group, which was formed last year to raise awareness about the industrial history of Lackawanna NY and the building's history. 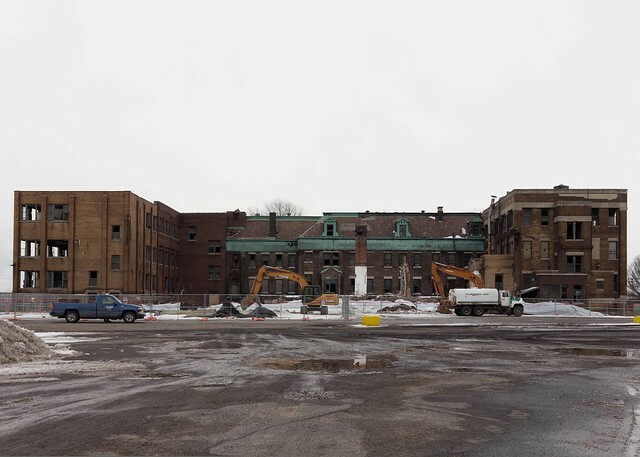 The group had previously protested the demolition action and in June held a public hearing on the future of the building with professional preservationists and Lackawanna Common Council President Henry Pirowski as panelists. Hon. Fredderic Marrano has granted a hearing on the matter which is scheduled for February 13 at 1pm in Lackawanna City Court. Meanwhile, the Court is allowing the demolition to proceed. This image from February 7, 2013 shows the extent of the current demolition activity. The chemistry lab building is mostly demolished. Here's the May 2012 record image. 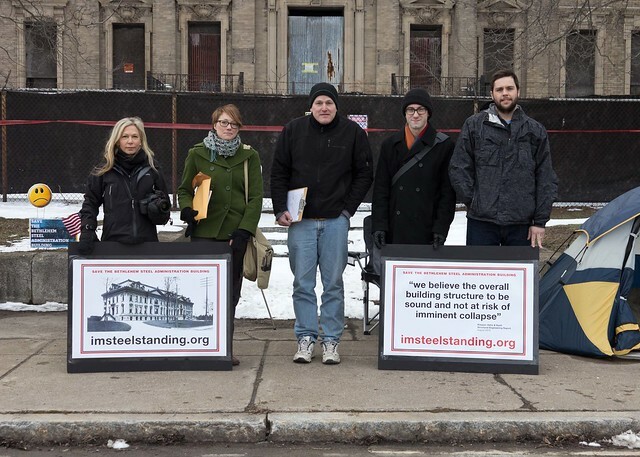 In a related matter Lackawanna resident and activist John Nowak has been protesting the building's threatened demolition with a hunger strike. He's been camped out in front of the building since mid December. Members of this group remain tremendously supportive of his efforts and would like to encourage you to come down and speak to him and lend your support in any way you can. For the latest developments and background information about the lawsuit, the building and the building's significance please join the FaceBook Group Save the Bethlehem Steel Administration Building and visit I'm Steel Standing the official website for this group's work. Mike Puma covered the press conference for Buffalo Rising here and Mark Sommer from the Buffalo News, here. Here's the full text of the Memorandum of Law filed with Lackawanna City Court and Order to Show Cause that was signed by Judge Marrano on Friday. Since breaking the demolition story in May 2012, this blog has covered the story continuously.